Manitoba’s only commercial coal operations were developed following discovery of lignite near the Turtle Mountain in 1879. Production began in 1883 with the opening of the Lennox mine and continued intermittently at the Vodden, McArthur, McKay, and Manitoba Coal Company mines until 1908. 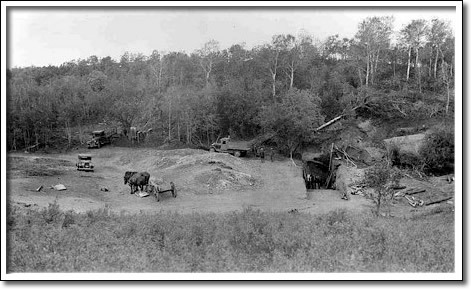 Coal was extracted from outcrops in ravines and from shallow shafts. Its availablility spurred settlement while offering supplementary income to local farmers. The construction of railways introduced competitive Saskatchewan coal and commercial production here was suspended. Interest in mining was revived during the Depression because Turtle Mountain lignite was cheaper than higher grades. At its peak, annual production of the McArthur, Henderson, Deep Ravine, Salter, Powne, and Deloraine Coal Company mines averaged over 1000 tons each. The wartime labour shortage and changed economic conditions forced the last mine to close in 1943.